Kissberg Construction welcomes the opportunity to support your construction needs. From our Stone Mountain headquarter; we support our clients in Atlanta and throughout the southeast. We provide services to local municipalities, state agencies, federal buyers, the commercial market as well as the residential market. As a general contractor, we can handle most of your project needs. Our core specialty is horizontal construction: demolition, hauling, grading, airfield repair and concrete work such as sidewalk and driveway construction. As a woman and minority owned small business, we have obtained EDWOSB certification with the SBA, DBE Certification with the Georgia DOT, and FBE Certification with the City of Atlanta. Our size allows us to be efficient and responsive. Our efficiencies mean better pricing and greater value to you and our responsiveness allows us to quickly ramp up and meet your tough deadlines. 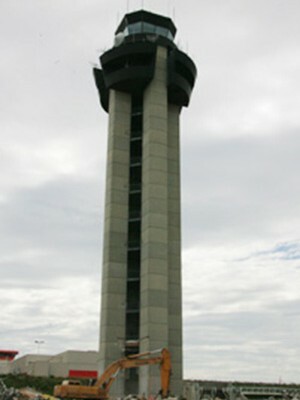 At 9:00 AM on August 6th the former FAA Tower at Hartsfield-Jackson Atlanta International Airport came falling to the ground. This project was headed by Kissberg Construction.